1. 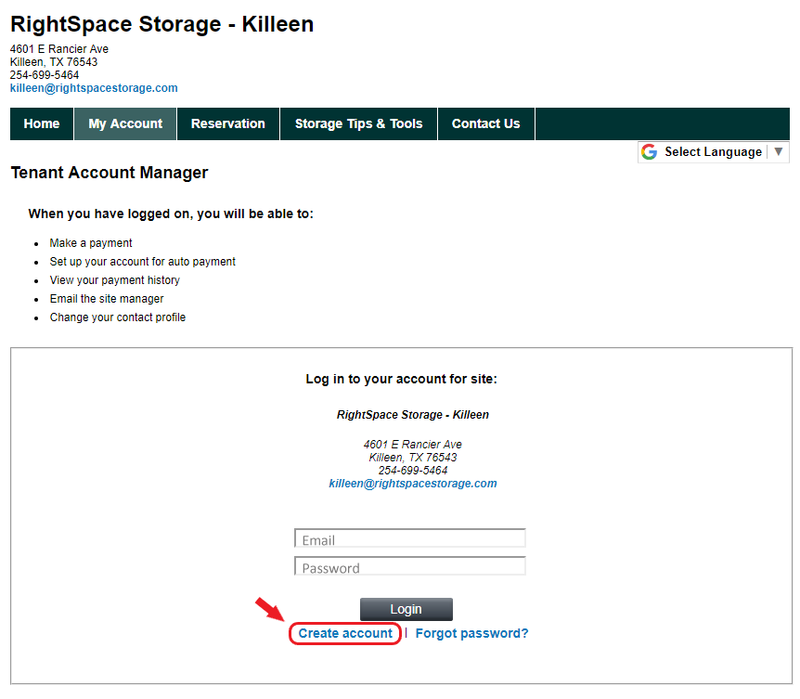 If you are on rightspacestorage.com, at the very top find and click on “Pay My Bill” to get started. If you already have an account and need to make a payment, scroll down to the “MAKING A PAYMENT” section found below. 2. 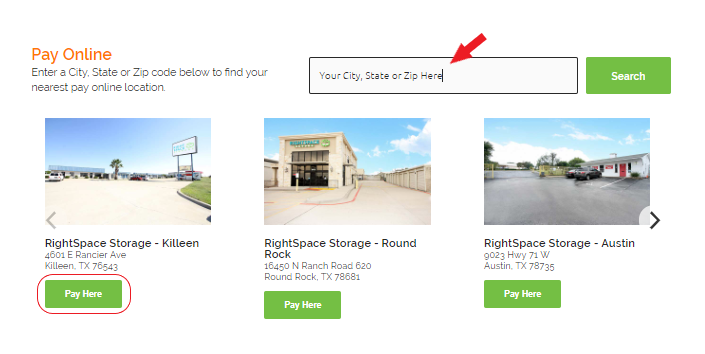 On the pop-up, enter your city, state or zip code to find your location, then hit enter or click search. 4. After clicking “Pay Here” you will get to the screen below. Click on "Create Account." 5. After clicking "Create Account" - you will see the screen below. 6. Fill out all the information in yellow. Below are tips to fill out the required fields if you need help. 7. Once you fill out all the required values and submit, you will see the screen below. Click on the “Click HERE to Logon” to continue. Thanks for registering your account in our website. Please click here to logon to your account. 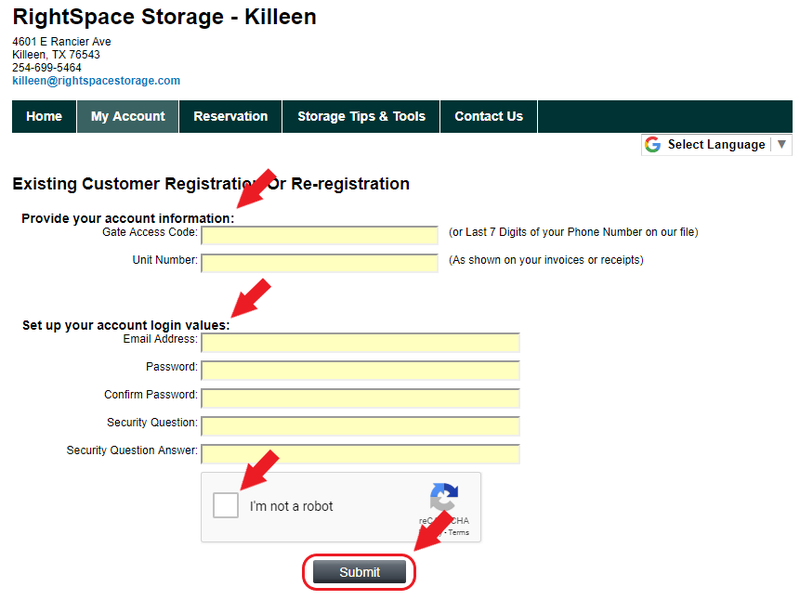 *if you have multiple units you just need to sign up once, the other units will show up once logged in unless your manager did not link the units – simply create another log-on for the other unit(s). Go ahead and search for your location by clicking "Pay My Bill" at the top of our website. Enter your zip code and look for your location below, then click "Pay Here" depending on your location (see step 1-3 at the top of this page if you need help finding your location). 9. Next, you will be taken to the page below. Enter the values you previously used for the email and password to create the account. Click “Login” and it will take you to your account. 10. Once you log in, you will see the account overview page with all your information. Click on “Make Payment” to continue. You can update your contact information by clicking on “My Profile” and following the prompts. 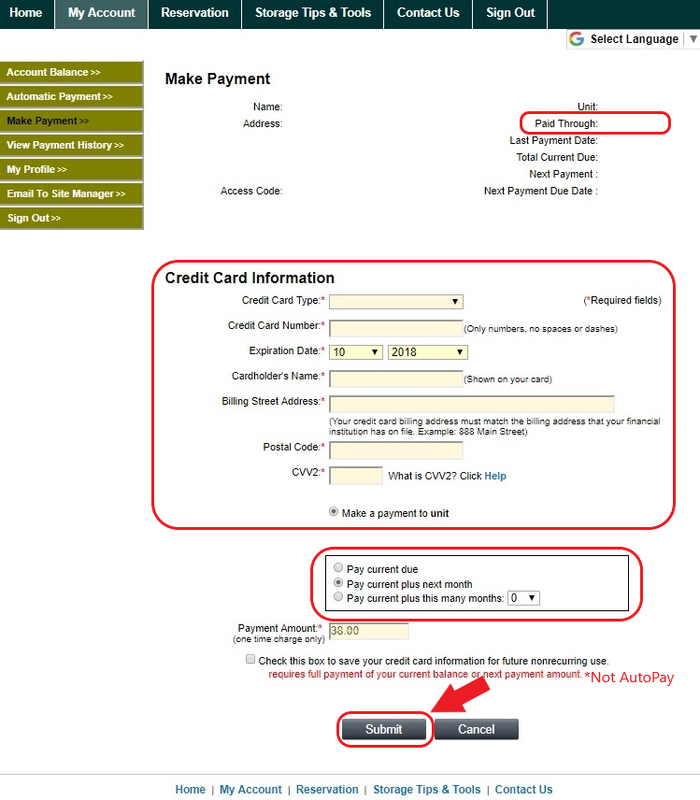 You can set up auto-pay by clicking on “Automatic Payment” and following the prompts. You can also save your card on file, (this is not auto-pay) just before submitting your payment, for future use. 10. After you click on “Make Payment” you will see this page. *There is no balance due if your paid through date is after today’s date. Enter all your credit card information and hit "Submit"
Pay current due – allows you to pay only if there is something due. If there is nothing due it will charge you $0. Pay current plus next month – clicking this option will pay the current month (if something is due) plus next month. If there is nothing due for the current month, it will only take your payment for the next month. Pay current plus this many months – pays the current month if there is something due, plus however many months in advance you want to pay. *you can check the box below the amount if you want to save your card for future use (not auto-pay). 10b. Then it will ask you to click “Confirm” a second time to process your payment. If you are done printing or did not print, you can click below the second “Print this page” button on the blue “here” link. 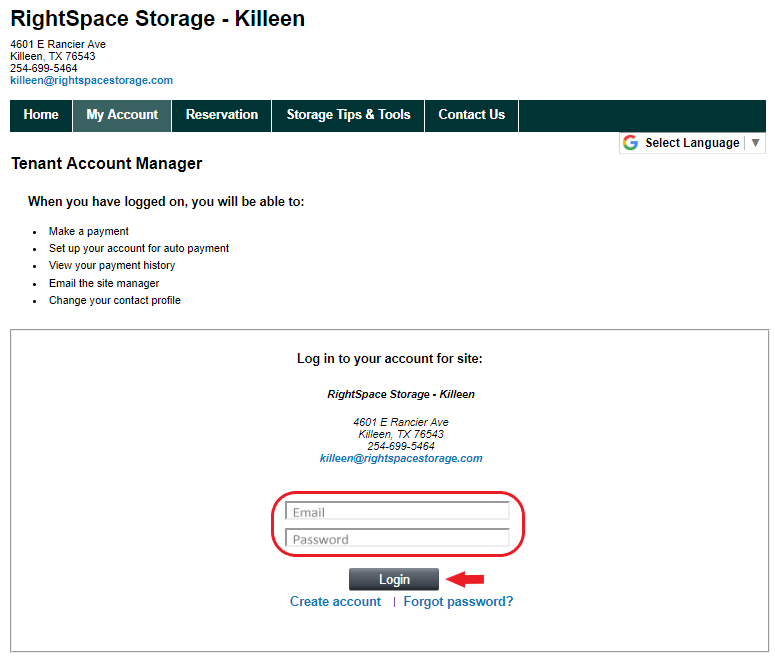 This will take you back to your account overview where you can sign out at the top right.